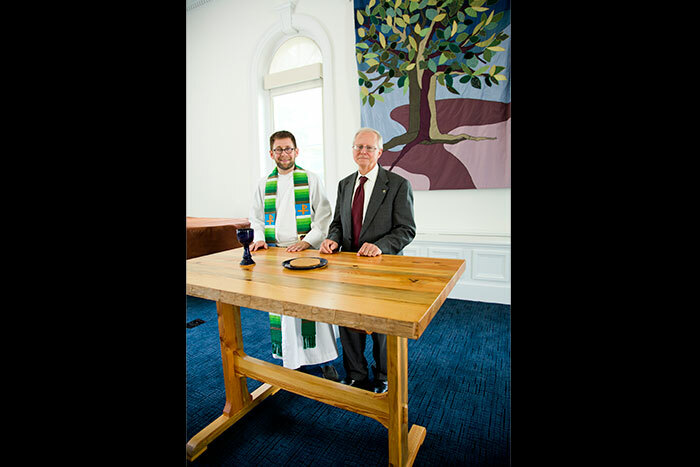 Oxford Chaplain Lyn Pace and Dean Stephen Bowen with the table made by Bowen for the college chapel. A brass plaque will be affixed to the table, commemorating the table's dedication and origin. 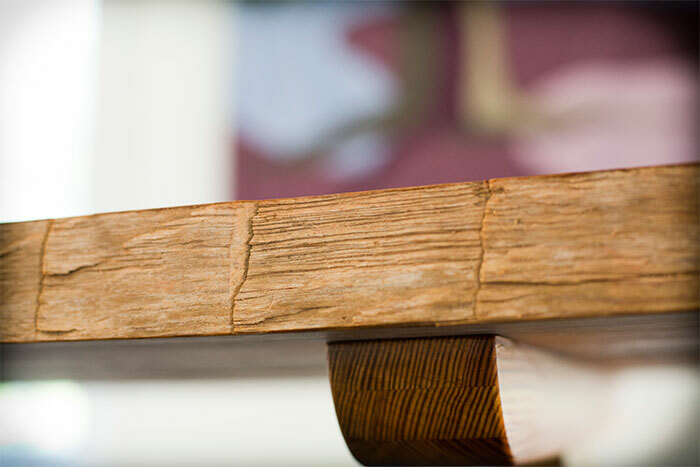 The finish on the table's edge shows the marks of hand-hewing. The table's trestle design was popular in the nineteenth century, contemporary with the chapel's construction. 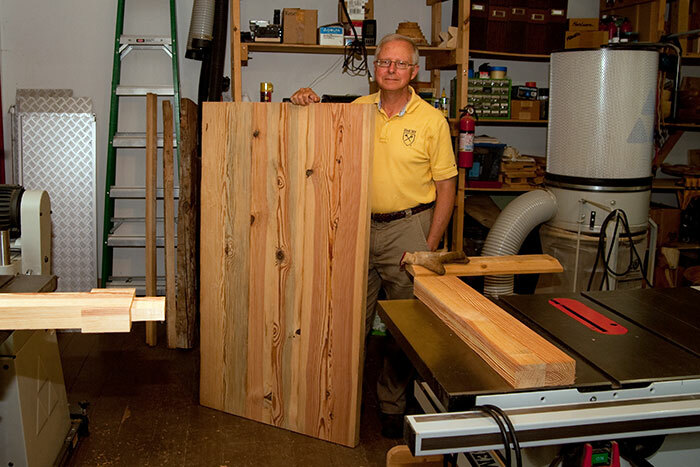 Dean Bowen displays the table top, constructed from heart pine salvaged from an original floor beam in Phi Gamma Hall. The woodshop is in the north wing of the President's House. 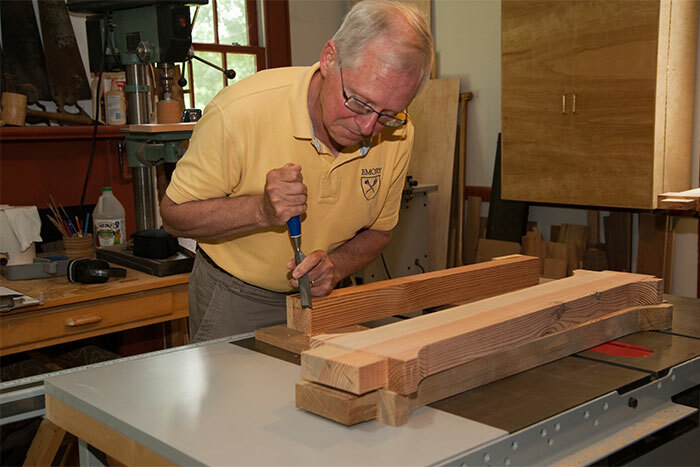 Here Dean Bowen uses a wood chisel to finish one of the table legs. When Oxford College Chaplain Lyn Pace began working on plans last winter to update the college chapel, he did so with a view to Oxford's historic past as well as its current and future needs. Built in 1874, the chapel was originally used for the twice-daily prayer services at which attendance was compulsory for all Emory College students and faculty members. Yes, you read that right: Twice a day. Five days a week. For everyone. As usual, though, times changed. "Today," says Pace, "Oxford and all of Emory enjoy a diverse student population. The building is used for prayer and worship — voluntary, not compulsory! — by a variety of student groups representing at least five religions, and this is also the venue for various concerts and lectures. With this in mind, the building's new carpeting, seating and technology accommodate a variety of practices and purposes. One of the items needed for the space, however, was more traditional to a chapel. "For Christian worship," says Pace, "we needed a table for communion. The old one was not aesthetic, historic or even serviceable." He wanted something that would have the gravitas appropriate to the chapel's history. Then the solution came to him: Go to the dean. Pace wasn't just seeking advice from Oxford College Dean Stephen Bowen. He knew that Bowen is a talented and accomplished worker in wood; the dean has often surprised award recipients, guest lecturers and Oxford retirees with a wood bowl or box that he has made, and he has built far more complicated designs, including furniture and even a wooden kayak/canoe hybrid. Bowen said yes to the project, and over the course of this past summer, he made the table in his personal woodshop. The shop is located in the President's House, the traditional home of Oxford deans and several Emory College presidents, including founder Ignatius Few. Built by Few in 1837, the President's House is the oldest structure owned by Emory University. Bowen installed his woodworking equipment in a ground-floor room of a "porch room" added as guest quarters about 1850. The daughter of Lucius Q.C. Lamar — Emory College alumnus Class of 1845, U.S. senator, and member of the U.S. Supreme Court — is said to have had her wedding in the room. An historic chapel and historic workspace deserved an historic piece of wood, and that is just what Bowen chose. For a few years he had been storing part of a beam salvaged from Phi Gamma Hall, Emory's oldest academic structure. An inspection in 2010 showed that the beam needed to be replaced, due to termite damage at either end. When the beam was removed and the ends were sawed off, several feet of good wood still remained. Bowen saved it for future projects, one of which was a bowl made as a farewell gift to former Provost Earl Lewis. Salvaging wood is not unusual for the dean. Whenever trees fall on the Oxford quad or elsewhere on campus, the dean is always there to consult with the removal crews to see if there is wood suitable for working. One of the most unusual sources came from a Kentucky coffee tree, highly prized by woodworkers, which fell on the grounds of the President's House. "Nearly everything I've made at Oxford came from something local that fell over," he jokes. 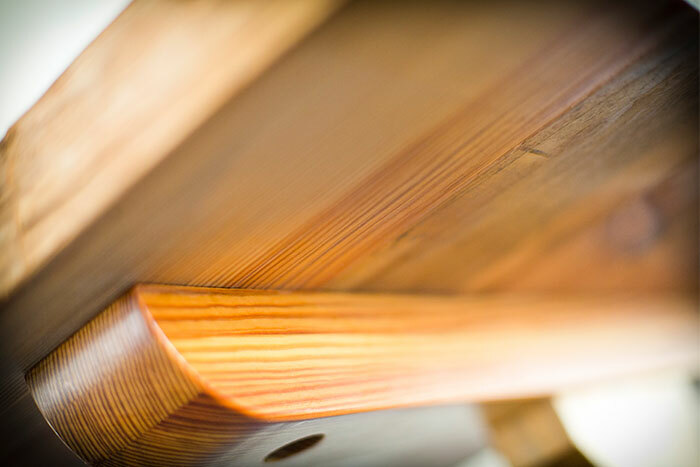 The large Phi Gamma Hall beam — approximately 12 inches by 12 inches — that was used for the communion table was of heart pine. Broadaxe marks at regular intervals along each surface show that it was hewn by hand. "Since we can date the building of Phi Gamma Hall to 1851," says Bowen, "one thing we can be sure of is that this is from an old-growth tree. I was able to count 230 rings in the cross section of the beam ends. That would date the source tree to about 1620." Bowen chose a simple trestle design for the table, a style that would have been common around the time of the first Communion. 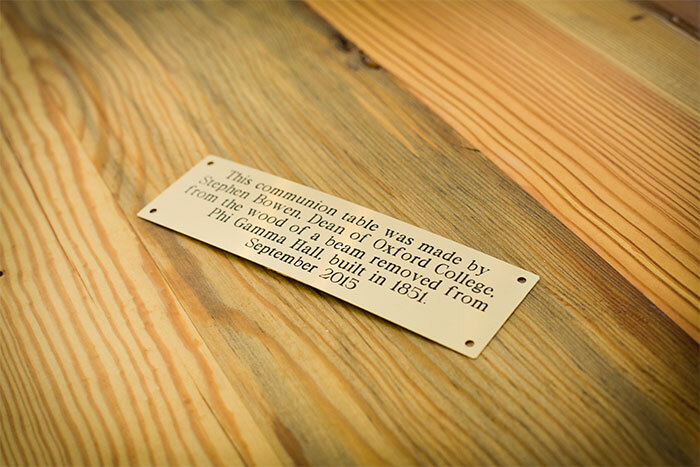 At a ceremony on Sept. 2, the table was presented and dedicated in the Oxford Chapel. Oxford administrators have often said that taking care of Emory's original campus is both an honor and a challenge–seven buildings in daily use at Oxford were built before 1900. 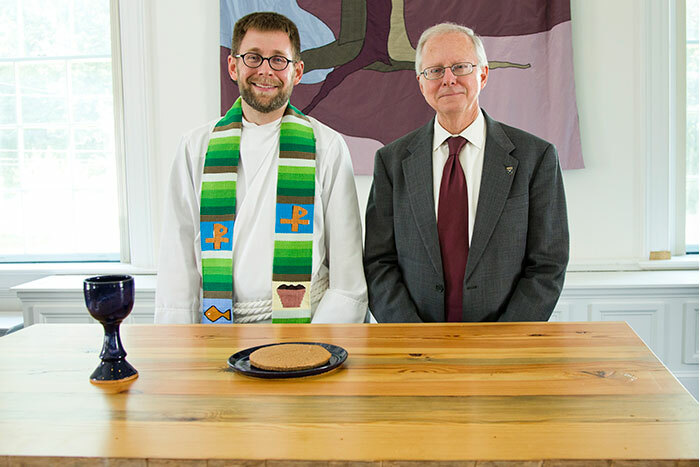 That combination is embodied in Bowen's communion table, whose provenance from the 19th century and 21st century use in an interfaith space speak powerfully to the important balancing act of celebrating history while cultivating relevance.